At age 29, Nicole Johnson is one of the youngest candidates for the 20th Ward aldermanic elections. 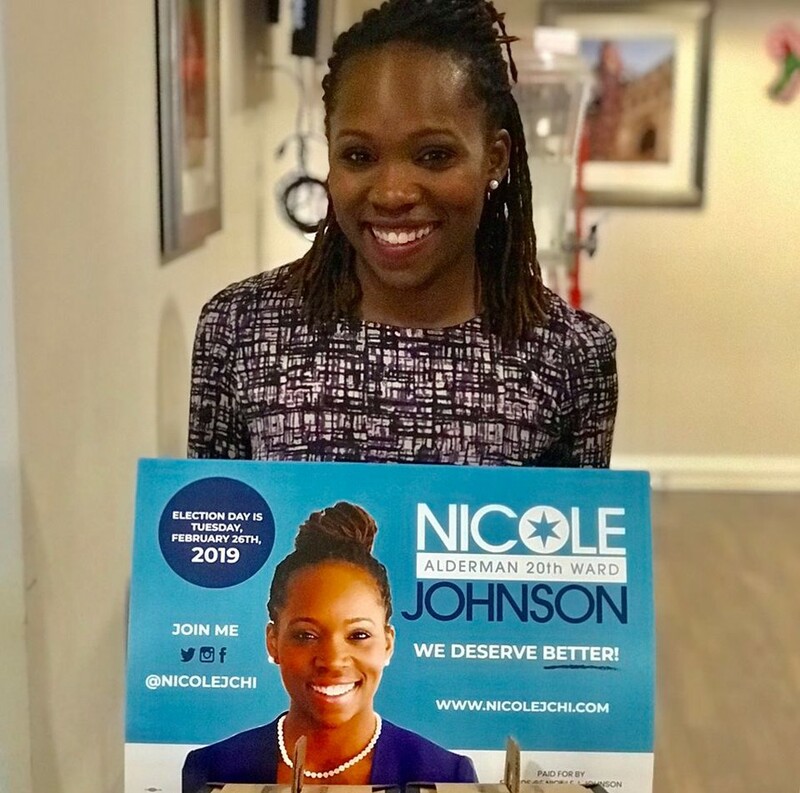 At age 29, Nicole Johnson is one of the youngest candidates for the 20th Ward aldermanic elections this coming February. The 20th Ward’s candidate pool has seen an influx of many younger candidates since incumbent alderman Willie Cochran was arrested on corruption charges and withdrew from the race, becoming the third out of the past four aldermen arrested on corruption charges. Johnson is running against 14 other candidates, including 25-year-old Anthony Driver, a political activist and recent graduate, as well as 30-year-old Kevin Bailey, the Democratic committeeman of the 20th Ward. She brings to the race a background in education and a long history of involvement in the Englewood community of the 20th Ward. Her main platform planks—improving education, safety, and economic empowerment—largely stem from her history with Englewood. The Maroon sat down with Johnson to talk about her candidacy. Nicole Johnson grew up in Englewood. She credits her grandmother, who raised her for most of her childhood when her mother did not have a stable job. She graduated from the University of Michigan with a bachelor’s degree in political science, from National Louis University with a master’s degree in teaching, and from the University of Pennsylvania with a master’s degree in education policy. Prior to running for elections, Johnson worked as a third-grade math teacher, as well as the data and communications manager at a community development non-profit in Englewood. After encountering an open gunfire in 2011, she said she then realized that “bullets don’t care if you’re poor or well off. I realized that to uplift the community, I needed to breakdown the systems that perpetuate violence and stopped growth in the ward.” This sparked her shift towards policy and politics. Drawing on her work in education, one of Johnson’s major focuses is education reform. She said her main goals are ensuring that all schools have libraries and creating formal partnerships between different educational institutions, such as public elementary or middle schools and colleges. As a Local School Council member for Kershaw Elementary School, a magnet school in Englewood, Johnson believes one example of a partnership would be between Kershaw and Kennedy-King College, which Kershaw sits right behind. She said that parents and elder siblings of the elementary school students can benefit by enrolling in classes in the college. She is also campaigning on spreading a trauma-informed model of mental health to ensure safer communities. As many students may experience trauma in the surrounding community, she said that responses to students lashing out should focus on fostering mental well-being. When asked about implementation, she suggested curriculum changes at schools—including incorporating more journaling and self-reflection and altering physical education coursework. She said that on top of mental health, she also believes access to guns, as well as lack of economic development, all tie into her plans for community safety. Her policies include creating land trusts so that renters can eventually buy homes, as well as forming development committees to keep track of this progress. One of her other propositions was creating public infrastructure through renting the empty buildings in the ward to assist residents in transforming “side-hustles” and freelance jobs into startups. Johnson referenced catering as a business that had this kind of potential. Caterers could rent out commercial kitchens or the aforementioned vacant spaces to hire staff and build “pop-up restaurants” for several months. This proof of profit would allow the banks to support them into gaining larger contracts with retail companies or even transitioning into actual restaurants and shops. “There is a person that made a great pound cake at Christmas and everybody said, ‘Oh you should start a business!’ and now they’ve opened up their own bakery,” she said. Johnson said her approach to this election is to personally get to know as many members of the 20th Ward as she can. She canvasses around the ward on a daily basis and frequently attends candidate forums.